Dialogue among people makes change of perspectives and gaining insights possible. It is the basis for growth and change, therefore it is the fundamental principle of my work. With lots of experience, passion and humor, I support your further development in both work and private sectors. To ensure successful processes of change, I encourage your ability to advocate for yourself and enrich your individual abilities and competence in problem solving. 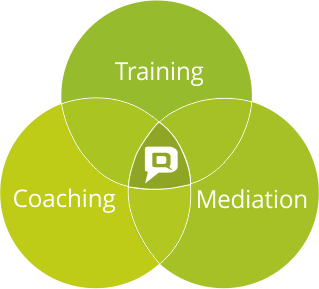 My work is a combination of goal-oriented training, coaching, and mediation techniques. My methods are a result of more than 15 years’ experience of work. These effective tools can be interfaced, customized, and applied flexibly according to your needs, resources, and plans. I develop and implement suitable strategies, with the support if expert colleagues, if appropriate. In either individual or group settings you will receive theoretical knowledge as well as practical experience focused on a specific topic. These trainings are based on research results in neurobiology. Included are cognitive and affective, as well as behavioral teaching and learning methods. Practical relevance is essential for successful learning. Therefore, I ask about your prior experiences and attitudes towards the chosen topic when designing the training. Through reality-based exercises and guided reflection the transfer of learning into everyday behavior is ensured. Systemic business or personal coaching helps you reflect on your work or private goals as well as relevant relationships. Through analysis of organizational and psychodynamic contexts, I support you to develop new perspectives. You reflect on your individual perception, interpretations, and evaluations before revising and adapting them, taking into account the underlying emotions and attitudes. This helps you recognize your scope of influence, develop action strategies, and transfer them into effective and sustainable everyday behavior. With the mediation process I support people who want to resolve challenging conflicts in either work or private relationships. Most of the time communication and cooperation are impaired or even lost due to misunderstandings, lack of trust, or by default. I guide you in understanding your conflict and resolving it self-responsibly with your conflict partners. A structured mediation process in which you recognize your perspectives and needs helps you develop lasting and sustainable solutions together. Responsible for the process of mediation, I employ expedient intervention techniques which enable you to (re)establish constructive dialogue, resulting in mutual agreements. I offer my services training, coaching, and mediation in-house for your organization. Alternatively, I have rooms in Berlin Wilmersdorf and Mitte available.